Published byPublitech-Zeitschriften- und Buch-Verlag e.U. In 1983, Gerhard Buchberger, the editor-in-chief of Praktiker, was asked by the photo industry whether the photo-supplement of his magazine could be published as a separate photo magazine. At the time, all attempts to establish a photo magazine in Austria had been unsuccessful. 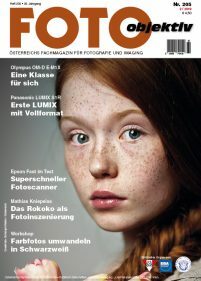 Buchberger developed a concept, and in January 1984, the first issue of FOTOobjektiv was published by Vorwärts-Verlag. Incidentally, the name is a pun in German - it means Photo lens on the one hand, but it also stresses that the magazine is independent, that is ‘objektiv’. In 1986 Vorwärts-Verlag decided to stop publishing many of its magazines and so Mr. Buchberger took over Praktiker and FOTOobjektiv in a management buyout. Around this time, FOTOobjektiv joined EISA, making FOTOobjektiv one of its oldest members. In July 2007 FOTOobjektiv was sold to Klaus Lorbeer, an experienced Austrian journalist specialising in photography and IT. The main target group of FOTOobjektiv is the ambitious amateur photographer, but beginners and professional photographers are also found amongst its readership. FOTOobjektiv presents award-winning photographs taken by amateur photographers. It also offers hardware reviews, new product news, features on new trends and technologies in photography, an overview of upcoming photographic competitions and six pages of commentary on controversial developments in the photographic arena. On its recently relaunched website, FOTOobjektiv readers can find photographic exhibitions in Austria and create their online photo own gallery. There’s also news of about the latest products and naturally the EISA Awards!